Common light fixtures found on dairy operations are T8 fluorescent, metal halide, high pressure sodium, and more recently, light emitting diode (LED). Each fixture has a unique set of benefits and drawbacks. For instance, fluorescent lights are energy efficient and usually pay for themselves within 2 years of installation. On the other hand, fluorescent fixtures require maintenance, perform poorly under cold or hot conditions, and contain mercury which could be disastrous should a bulb break around lactating cows. High intensity discharge (HID) fixtures provide ample light at ground level when ceiling heights are greater than 12 feet. However, these fixtures require a long pre-heat or start-up time. Finally, LED lights can provide high energy efficiency with a reported 100,000 hour operating life. This is significantly longer than the reported 20,000 hour operating life of fluorescent and HID fixtures. Moreover, LED lights are expected to have lower maintenance costs, contain no mercury, and provide instantaneous reliable light. Though LED fixtures are expensive when compared to the other fixtures. These unique attributes can make it confusing to select fixtures best suited for dairy operations. However when considering implementing LDPP, LED fixtures may provide an edge. Consider this: lighting performance is often measured based on lumens/watt. This can be a misleading for dairy producers because lumens represent effective light for the human eye. Dairy cows perceive light differently than humans meaning a light fixture can provide ample lumens/watt, but may not provide light in the appropriate spectrum to stimulate milk yield. For instance, high pressure sodium fixtures provide high lumens/watt; however light output from these fixtures is biased towards longer wavelengths which cows cannot perceive. Fluorescent fixtures provide ample effective light for the cow; however under cold conditions light output of fluorescent fixtures can decrease by more than 40%. 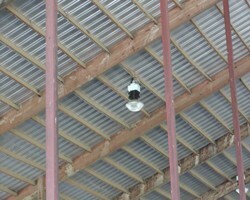 Cold conditions would be typical of most barns during the winter months, precisely when supplemental lighting from light fixtures would be required. LED fixtures can provide light in the same spectrum as sunlight and are more reliable under cold conditions. These two considerations suggest LED fixtures may be best suited for implementing LDPP; however this scenario needs to be investigated under barn conditions. Currently, Pro-Dairy is conducting a study investigating the cost benefits of LED lighting systems and T8 fluorescent lighting systems on dairy operations. This study will account for the initial cost of the fixtures, fixture performance, operating life, expected energy savings, and milk production to determine which lighting system is the most cost effective for dairy producers.